While single-DIN car stereos are still the most popular size, double DIN units are still very popular as they add more screen usability. They’re perfect for touchscreen controls, too. 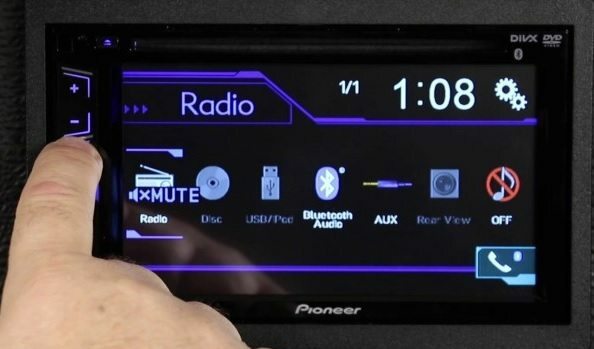 In this Pioneer AVH-290BT full review I’ll cover the details you want to know and my final rating, along with the pros and cons to know before buying. It’s a fun unit to use and I’m excited to have had the opportunity to review it. 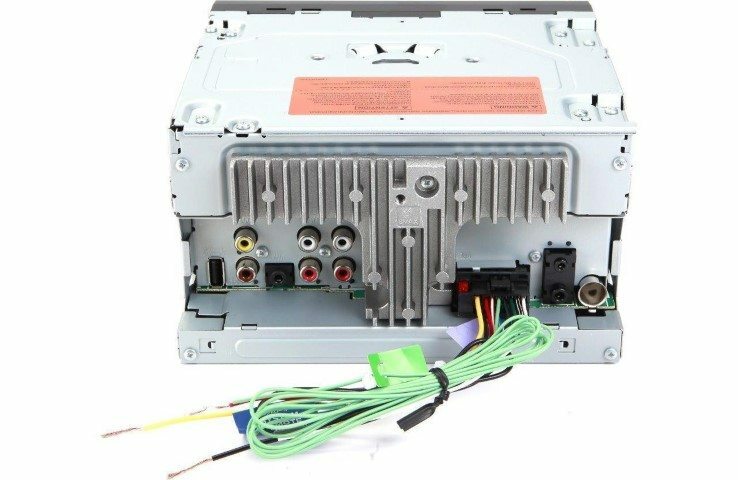 The 290BT is part of the AVH family of multimedia DVD car stereos from Pioneer that feature DVD playback (as opposed to the MVH series, which is digital media only) and quite a few similarities including the panel front styling and controls. It’s a mid-priced model with so many features I’m honestly impressed. Years ago a similar product would have sold for at least $400, and in the past they haven’t even had as many ways to enjoy music either! Probably its most convenient and appealing feature for today’s smart phone users (both iPhone and Android) is the great sounding Bluetooth music streaming and the ability to handle hands free calling (see below). The display is clear and looks good at night. Controls are simple but might not be ideal for anyone, as the button arrangement is a little different than other models. The touchscreen is beautiful and is responsive, too. Functions are clear and easy to understand. The unit has a good, quality feel and construction is just as good as you’d expect from Pioneer. Unlike generic double DIN units I’ve seen, it simply looks better built and you can tell good engineering was used. I really like how it looks! The display is great, and obviously detail was put into the design. Colors are vivid and accent the various screens nicely (as well as when music is being played through various sources). For basic controls like volume, track, and a few more the buttons on the left side can be used. For other basic functions the touchscreen, featuring large and easy to read icons, comes into play. The display is a 6.2″ WVGA (800 x 400) 16:9 type display with LED backlight, an illumination timer, and 3 selectable display colors. Pushbutton colors remain blue. There’s also a dimmer setting as well. The 16:9 ratio display means video will be rendering properly without terrible skewing due to being stretched or modified to fit a 4:3 display like in the past. Unfortunately, like many similar display, it can be a bit hard to see in bright sunlight. The unit also features AVRCP, which is a Bluetooth protocol to allow control music playback on your phone from the car stereo’s controls. 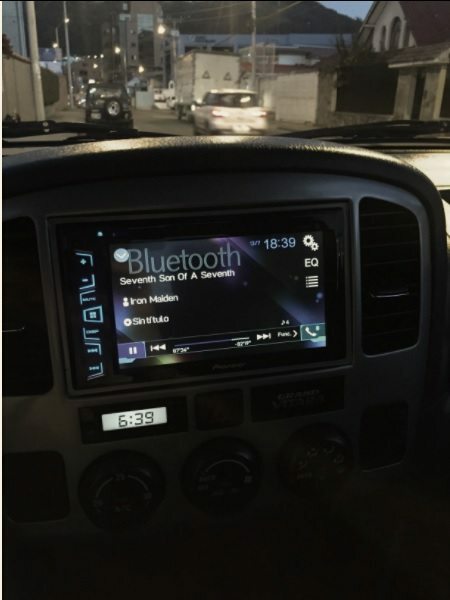 Bluetooth connectivity is simple and pretty quick, meaning you won’t have a lot of fuss just getting connected to listen to music before driving. As the AVH-290BT supports the A2DP audio protocol, audio is clear and doesn’t sound grainy or like lesser streaming audio from years gone by. It’s a great sounding head unit and playback is easy to use. Although I use Pandora, I’m more of a Tidal and Spotify user right now. The sound was great, and I really enjoyed listening through it. Bluetooth audio is excellent and pretty simple to use. It’s cool being able to see your music title & info on the display, too! Note: Controlling a music app from the unit is only supported for Pandora, so for Spotify and other popular music apps you’ll have to use your phone’s interface. Included is a clip-on microphone which plugs into the stereo and allows for hands free calls to be made. It’s easy to install and works well. Call quality is very good and generally the other party on the line can hear you well. Calls can be automatically answered if you choose and of course when dialing out you have access to the phone book contacts to select first. You can also take the call directly on your phone as well as change the calling person’s volume level (volume adjustment is limited to 3 levels, though). This wonderful double DIN unit supports a wide range of media formats and inputs – definitely a good value for what you pay! Menu selections are clear and easy to use. Every one has a good looking icon, too. A USB flash drive connects easily by just plugging in your drive on the front and then selecting the files you’d like to play. Unfortunately though, there’s no FLAC lossless music support, which is unfortunate for those who enjoy higher bitrate audio. If you want to have video playback working while in motion, you’ll have to add a bypass module as the unit won’t playback video from the factory unless the handbrake is used to engage it and allow it. To get around that you’ll need to pick up a bypass module but they’re $15 or so. There are actually 2 USB jack, one front and one on the rear. The 2nd is provided to allow direct iPod connectivity if you like. Another great feature is the composite video output. Have kids in the car? You can connect additional monitors to for viewing the display and movies. 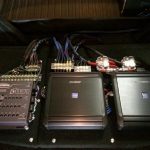 It’s simple to connect (via the RCA connector) and most aftermarket in-car LCD monitors have a provision for this. But don’t worry – there’s even more! The stereo can connect to a rear-view camera to allow you to see the area behind you while backing up. It’s not difficult to install and while you can use the Pioneer backup camera (sold separately) to do so, that’s not our only option. It can work with other brands as well. When enabled the display automatically switches to the backup camera and then returns to your current function in use. However, that does require additional installation work for the camera wiring required to have the receiver know to turn on the camera image. That’s a bit more work and you may or may not be well prepared for that (but it can often be done by connecting to power, ground, and a back-up bulb for the signal). I personally find the push button controls on the side to be fine, but some have a few gripes about their ease of use. 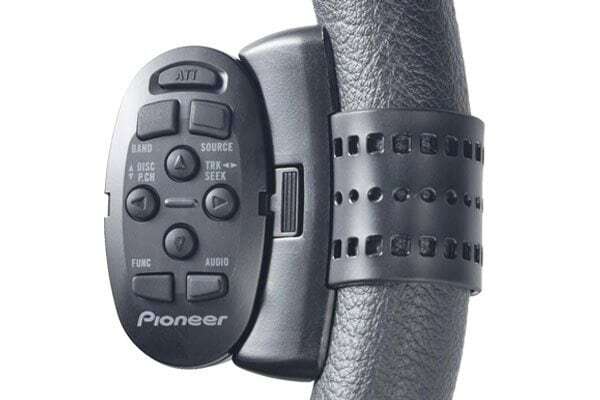 If you have “fat fingers” or don’t care for them there’s another option – you can add an optional Pioneer remote control like the one pictured below. Additionally a great accessory you can add is the CD-SR100 steering wheel remote (sold separately) which also detaches for handheld use. It’s a cool little remote and lets you adjust basic functions and switch sources while driving! You can also interface with factory steering wheel controls as there’s a provision to connect an aftermarket interface like the PAC ControlPRO or the Axxess ASWC-1. Expect to spend about $50-$75 for the adapters and don’t forget it will take some additional installation time and effort. But it’s a great feature to be able to use. Unfortunately there aren’t any anti-theft features which means you’re risking someone deciding they’re going to take what you’re earned. There’s an inherent risk of loss there, but hopefully you either keep your vehicle locked up or might consider adding a vehicle security system. I would have preferred some time type of removable faceplate or other deterrent. As with all other double DIN car stereos, installation can be easy or difficult depending your vehicle. That’s another subject to deal with in another post. 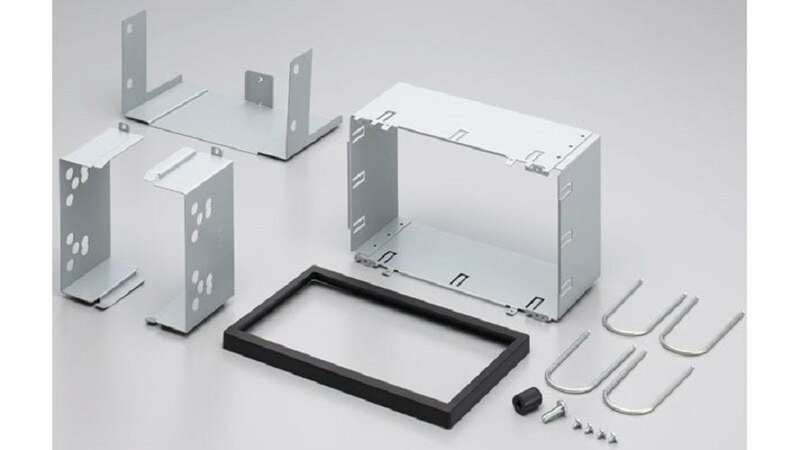 One thing you should know: for installations in which you’ll need a locking sleeve with bendable tabs, the installation parts are a separate purchase. Heads up! If you need custom installation items as pictured, they’re a separate purchase: Pioneer ADT-VA133 installation kit, selling for around $40. Advanced music adjustment controls and equalization – nice! One of the single greatest things about it that I really love is although it’s a little limited, the ability to change audio and use the built-in equalizer is a really cool feature and especially helpful for getting the best sound possible for your money. The 5-band equalizer is very easy to use and has good boost and cut ability (+/- 12dB). You can save your settings to user presets (or select a factory preset) easily. Unfortunately the EQ bands can’t be changed to allow much better control, which I don’t like. I would have liked more flexibility for the equalizer frequency bands, however, as they’re fixed at 100Hz, 315Hz, 1.25KHz, 3.15KHz, and 8KHz which isn’t enough for the most effective use of a 5-band range. But it’s still and easy to use and great sounding bonus to have that does allow a bit of sound control. If you’re planning to add external amps, you’re all set as the 4 RCA outputs are pretty flexible and can be used along the crossover functions for driving speakers safely and with lower distortion when amps are used. For subwoofer use the rear RCA outputs are switched to low-pass outputs controlled by the subwoofer menu adjustments. 4 RCA output connectors (front and rear, or front and subwoofer) allow expansion to high power amplifiers and other system upgrades. The subwoofer control is very good and allows changed everything from the crossover frequency to the output level. Additional jacks for the rear camera, video out, steering wheel controls, USB, and the hands free microphone are shown. Unfortunately, for some reason the RCA signal level is a 2V rated output unlike Alpine which has some models providing an even higher 4V output. A higher output signal would have been even better for those who want to use and external amp. Still, it’s a good enough signal and if you look at “the whole package” you’re getting so much audio power and control it’s hard to complain! It’s a minor complaint given the price range we’re talking about. And the really important question – how does it sound? All in all, the AVH-290BT is a great sounding unit. As the internal amplifier is rated at 14W per channel into 4 ohms, that means the power is limited to somewhat-loud volumes but can’t power a more serious pair of components speakers, for example. It’s a wonderful sounding unit – don’t get me wrong! DVD, USB, and especially Bluetooth sound wonderful and are a lot of fun to listen too. Playback is great without glitches or pops you can get from lesser quality brands. 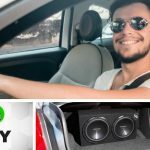 The good thing is you can turn on the optional high-pass crossovers to get even more volume and to keep speaker-distorting bass out of your factory-installed or aftermarket speakers. That’s a really helpful feature, but ideally when doing so you’ll have a subwoofer installed to fill in the extra “punch” the head unit can’t give you. In my opinion Pioneer has continued its legacy of well designed, user-friendly car stereos and the AVH-290BT is an excellent value. It’s feature packed and highly expandable. It’s hard to believe how much you get for around $200 – years ago a comparable unit would be selling for $400-$500 or more easily! I would have like to seen more adjustable EQ bands and an internal amplifier with more power. But you can’t have everything, right? It’s an easy to use, great sounding unit that was exciting to get familiar with and can be the center of a truly dazzling audio system if you want to expand later. Don’t hesitate to pick one up – You’ll love it! Go check out the awesome reviews and current pricing over at Amazon. 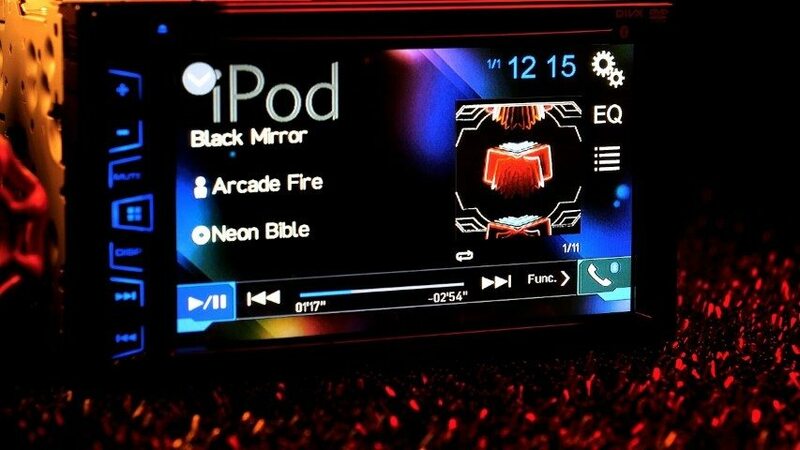 The AVH-290BT is definitely well built, well designed, and the user interface is clear and easy to use. Audio is clear, great sounding, and Bluetooth pairs easily and works well. Pandora controls work well. The hands free calling feature works great and makes driving while talking both safe and legal. 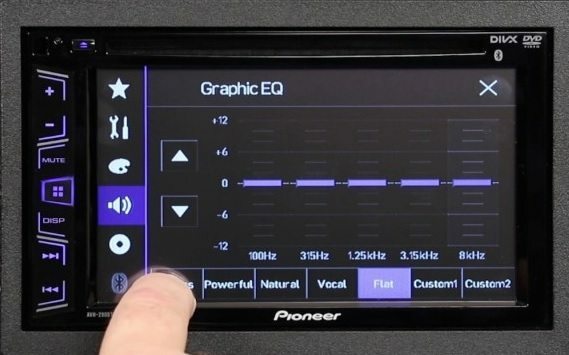 The EQ and crossover features are helpful and easy to use, although EQ use is somewhat limited. The flexibility is superb for the price and having so many audio inputs means you're good to go for trips. Video works well but is locked out when driving. This double DIN would make a great centerpiece for your custom sound system or just a simple factory replacement. You'll love it aside from the pushbutton controls.